Grrrrrf. As I said last time I appeared here, that means "hello again." I'm Pluckie. I'm a dog, and people tell me I'm good luck to them because I'm black and white. I've also been told I'm a spaniel-terrier mix. And now that the third Superstition Mystery is out, I can tell you that I'm in this one, too. It's called Unlucky Charms. As always, I like to hang out with my human, Rory Chasen. She manages what people call a store. Hers is the Lucky Dog Boutique, and I do consider it pretty lucky. For one thing, I get to hang out there. For another, they sell things there that are fun. That includes the new dog toys Rory designed. The problem is that, as Unlucky Charms progresses, a human is murdered. Now, that happened in the other books about Rory that also starred me. But this time the lady who gets murdered has been arguing with Rory, and she's found with one of Rory's new fun toys, a stuffed rabbit with a large rabbit's foot, near her body. My poor human is therefore set upon by other humans as the possible killer. I know better, of course, and try to tell them so, but it's Rory herself who has to make sure she's not arrested. And I don't know what I'd do if that happened. She's the best human around. Why was that lady--Flora Curtival, I think--murdered? I'm not sure but I didn't like her. I recognized her scent since it showed up a lot in town. I heard some of the people say that she'd been doing all sorts of things to bring bad luck to local storekeepers, like stealing things and dumping unlucky salt on the ground. Anyway, I tried to do all I could as a lucky black and white dog to help my human. Did I help? I certainly hope so. I guess you can find out by reading Unlucky Charms. 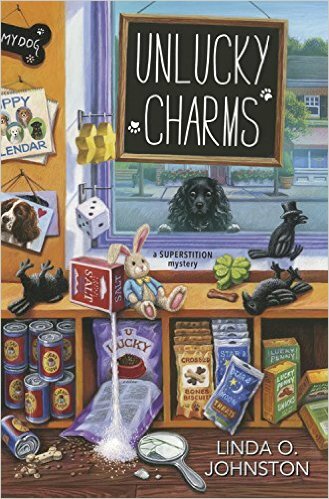 UNLUCKY CHARMS, the third Superstition Mystery by Linda O. Johnston, is available now! I hope you helped. I will find out, won't I?